This pattern is just 😍😍😍. I love that the smaller stars go all the way to the edges. I love love this quilt!! It's adorable and love the fabric line you used too!! I had to get some soon as it was available! I did not realize the middle of the stars was the same pattern til you said so... Amazing what color can do! Thanks for the giveaway! 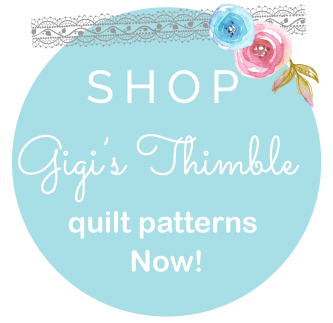 This pattern and quilt are so fun and refreshing! I too like how the centers of the stars look so different with the different color placement and values. For example, the one with the navy points and the little bit of blues, mint and pinks. So lovely and thanks for sharing your talents with us all. Oh, I love anything stars and you are right--the vintage market fabric is just right! I think your pattern is darling--i have a big bundle of red white and blue that I've been collecting and this might be really cute for it!! Love the pattern and the quilt. I would prefer a photo of the real quilt on the cover, since you asked. If I am not lucky enough to win this, I will be buying it! Love the pattern. Just can not have too many stars! I always love a star quilt and this one is fantastic! The star centers are really pretty and make the quilt so interesting! This is really cute. Iv love granny squares and having them as the star centres is genius. It is fabulous!! I love star quilts and I love happy, fun colors. The mix of star sizes gives it more interest and movement. The pattern caught my eye immediately! I love it! Such a fun variation on a star quilt. I love the center designs. And your fabric choices are always so beautiful! It is just beautiful Amber - I love how you give all the different dimensions/quantities for different sizes. This is really great so you can create exactly what you need without having to do all the maths. Love the design. I think an actual picture would be my choice as well. Your quilt is beautiful! I have just found your website through instagram and I am totally in love with this quilt! I am putting this on my to do list! Such a cute pattern! I love all your colors and especially love the straight line quilting. It looks so pretty and clean against the white background! I personally prefer actual photos of quilts on patterns...particularly if I'm using similar fabrics or colors because you can see the fabric designs better. I feel like a little kids jumping up and down saying, "pick me, pick me" I would be nice to win this. I love the colors, and whoever win, it well be great..
Love this pattern! I saw it on someone else's feed and had to get to the original to see what the name of this beauty is. The colors you picked really showcase the pattern and the quilting is magnificent! Congrats on a wonderful pattern! I LOVE the "Summer Stars"....I had bought a fat quarter bundle of 1930's to make one of my "Vintage Vibes" Dresden Plates so even after that I have lots of fabric left - what better use for it than your "Summer Stars" pattern..Anna. WOW! I love this quilt. So cute! Absolutely love it! you did an awesome job! and the quilting is amazing too! I love your quilt. It really says summery fresh. The straight line quilting is wonderful!! Thanks for the chance to win a copy of your pattern. I love this pattern and your quilt! I think it will be such fun to play with fabrics with this design. Thanks for the chance to win a copy! I love the new pattern!!!! I think it would be perfect for my bundle of Happy Home! Love it and can't wait to try it in some christmas golds reds greens !! Looks like a great pattern! 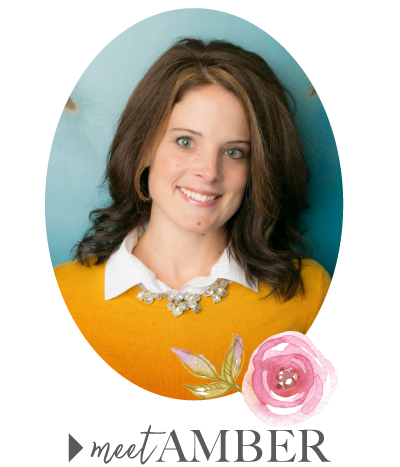 I "hired" my 16 year old graphic design expert to help me with my blog--I could not believe how quickly and easily she was able to make my vision come true. I'd love to make one of these over the fall/winter so its all ready to use next summer. I love it! Gorgeous stars; love the different centers in each of them! I think this would look great using Ambleside by Brenda Riddle, can't wait to try! I love the large and small size stars bouncing around. Really like the center of the stars as well as the colors used. Love the quilt. I really love this one! You can really make it very unique but I love your fabric choices! It is beautiful! Looks like it could be a good one for scraps too! Love the different sizes of stars too! I love everything about this quilt!! The colors, the pattern of course, and the straight line quilting make this one fabulous quilt!! Great job!! I LOVE your Summer Stars quilt--great pattern and fabric! Thanks for the giveaway. I love star quilts and this is quilt is gorgeous! I would love to win this pattern; thanks for the giveaway! I love your new pattern and it's adorable done in vintage market! When I first looked at your quilt, I thought you used a different center for every star. Then after reading your write up, I went back and looked at the quilt. Clever fabric placement. And a really cute quilt! So pretty! Well done. I love it! Your quilt is gorgeous, Amber. It's a gorgeous quilt, and my favorite part is the straight line quilting! Thank you! Great quilt, love the centers, thanks for the give away. You have a stunning quilt there!! I love the straight line quilting on it too. Great fabric placement and great pattern! I love your star quilt and all the little 'X's' inside of them. 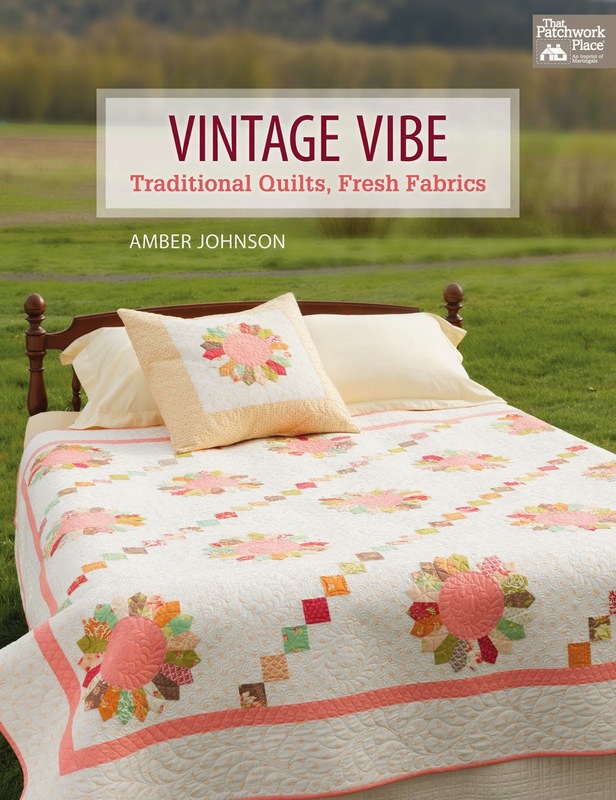 Tasha Noel's Vintage Market Fabric looks wonderful in this quilt. Congrats on your new lovely pattern! I prefer the real picture for the cover. I also really like the straight line quilting! You're right that it doesn't take away from the star design. It's so cool how the stars are different sizes and so colorful. I really like the different sizes of stars you used and I am a sucker for vintage fabric looks. I think you could make this very scrappy looking too! Thanks for all your work. Thanks for the chance to win, I would love to! Star quilts also give me a lovely nostalgic feeling and this one is no exception. I'm sure it will look wonderful in many fabric choices but the ones you chose are so fresh and inviting. Great pattern! What a beautiful quilt & pattern! Your fabric choices were perfect & the straight line quilting was just the right touch! I've been looking at lots of star quilts, trying to decide on one to make & I think I've found it! Beautiful quilt! I really like this pattern. I also thought all the centers were different until I read your post. Great job on fabric placement and pattern design. I love star patterns! So does my husband and he really likes this pattern too. Love the vintage look, it's beautiful. I love how you used the colors to get such a beautiful effect. I love PDF patterns because I like to have them right away. I love the paper patterns for storage. I love them either way!!! So beautiful! Lovely colors and design, congrats! I love those stars - especially the centers. The quilting is incredible too. Not sure my comment posted. I love this! Fabulous - I love star quilts!! Love everything about this quilt and am dying to get my hands on the pattern! Love LOVE this quilt! And I also like the straight-line quilting. 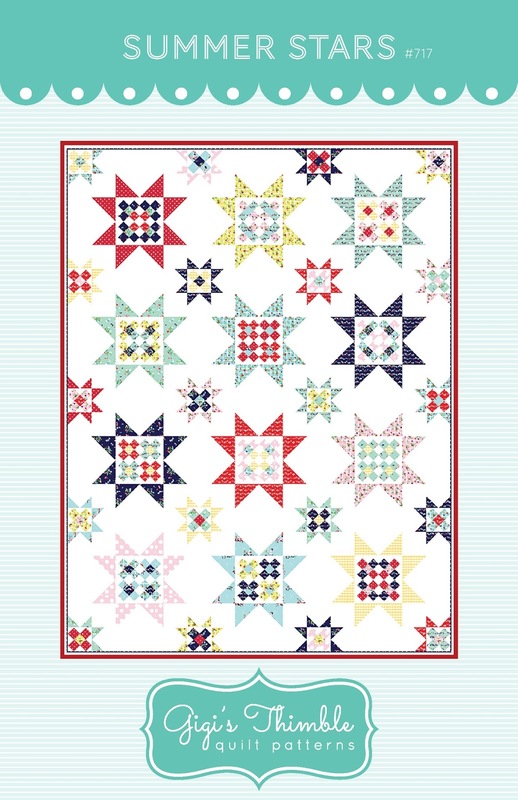 What thread was used for the quilting? Is it invisible thread by chance? Great choice of fabrics. Thanks very much for the giveaway. Love this pattern! I'd prefer to have a photograph of the quilt rather than a digital drawing. To answer your question: I like to see an actual picture of the quilt on the front and the digital picture on the back. Very pretty and wonderful colors! Stars are my favorite, no matter what color. Love your new pattern. Yikes, I love this happy pattern. I would LOVE to win this. Good luck to all though. Stars are my favorite! Love your new pattern and the fabrics you chose. I love star quilts! 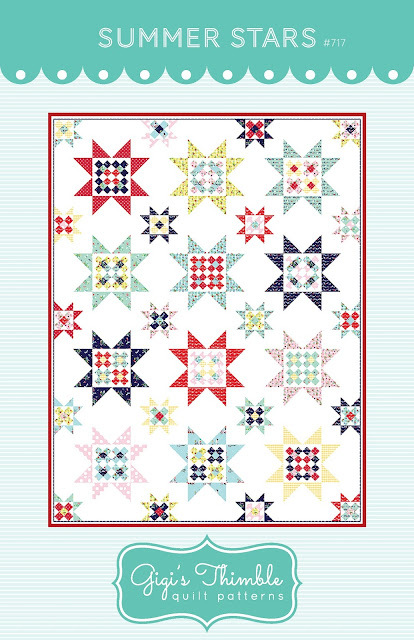 This quilt is fun with the stars on the edge, something I'd like to play with. Such a wonderful pattern! I love to piece patchwork and stars and this is a perfect combination. Thank you for the giveaway. Beautiful quilt & I really like your choice of fabrics. This is definitely one I want to make. WOW…another great pattern from the mind behind the Scrap Jar Stars phenomenon!!! Wow! What a different star pattern -I really like it. The stars all blend really nicely together - good job! I love this! So fresh and crisp! I like how the larger stars are a showcase for another fun block. Thanks for the opportunity to win! Summer Stars is certainly spectacular! I like the centers the best too...they seem to shimmer. This would make a great summer quilt. Love the name too! I may have posted this already but your stars are wonderful. A nice twist to a familiar pattern. I like it. I do so love this pattern! Sincerely, Paula K.
Oh wow - I need me some Summer Stars!! The fabrics you used are perfect for it too!!! I love it all! The pattern cover, the stars, the quilt and the fabric you chose. I love it all! The cover, the quilt, the stars and the fabric you chose! Great quilt! I think I prefer the actual photo. Although a few drawings using different fabric options is also a good addition to every pattern. Love the stars on white! Lovely pattern! The way the stars float on the background, the small stars that mimic the large ones, fabulous! I also love your attention to detail in making it -- specifically the stars with directional prints in the points and you've kept them all going the same direction. It shows the great care you've put into making this. I love that the blocks look like each one is different, but all you had to was change the colour placement, very clever. Love the pattern and I am all about star quilts! Thanks for the chance. This pattern is gorgeous and I love the fabric colors you chose for this quilt! Amazing work!! What a cute quilt pattern--so fresh and new! Love your fabric choices, too! Thanks for the giveaway! You have such a great aesthetic, I always love your design, fabric and quilting choices. Congrats on another beautiful quilt completion. Great pattern, hope I win! Love this pattern and yes, I do love the straight line quilting. I have a quilt top that needs to be quilted and I am going to try my hand at straight line quilting. Thanks for the inspiration and for the giveaway. So, how do I access the actual update or correction? 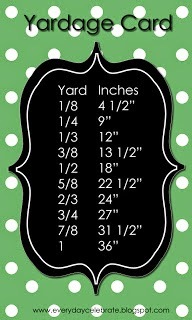 Love your patterns but want to print off the corrections and tape it to the pattern.